Since I started living in a 'proper' house (i.e. one I could decorate and buy nice things for without worrying they'd take on mould spores), I've become a serious fan of all things pottery and ceramics related. I've found that Instagram is a great place to find artists working in ceramics - and most of them have beautifully curated feeds! These six Instagrammers are some of my favourites. FLORIAN GADSBY is an apprentice potter at the Maze Hill pottery in London. Gadsby uses his account to document his apprenticeship, giving fascinating insights into the technicalities, successes - and even failures - of learning the craft. It shows off pottery as a science as well as an art form, and I thoroughly enjoy his posts. He also makes a small number of his own designs for his shop, which seems (understandably) perpetually sold out. 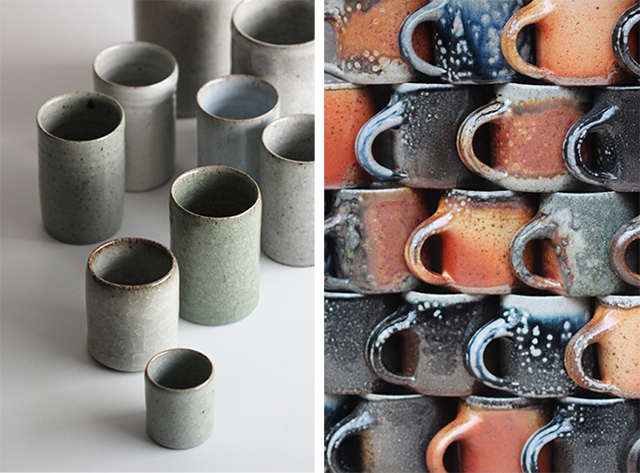 Keep an eye on his Instagram for notice about when new batches of his muted, crackle-glazed wares will go up for sale. 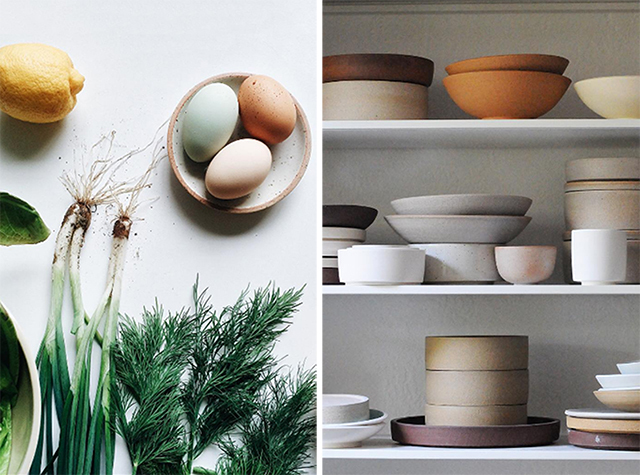 MIRO CHUN makes beautiful ceramics and equally beautiful images. Her stoneware is clearly influenced by her training as an architect, with each object in a collection fitting carefully with the others. On her instagram account she shares well styled photographs of food she's grown and cooked, on ceramics she's made, as well as pretty snippets of her life in Phoenix (I'm particularly fond of her chickens). ILLYRIA POTTERY is based in Oxford, England - sadly I missed the opportunity to see the shop last time I was in the city, but I'm planning on paying a visit to a one-off pottery wheel class at some point! Founder Katie Coston is inspired by nature, using its forms or even making impressions from things she's collected (like the little limpet shell saucers!) 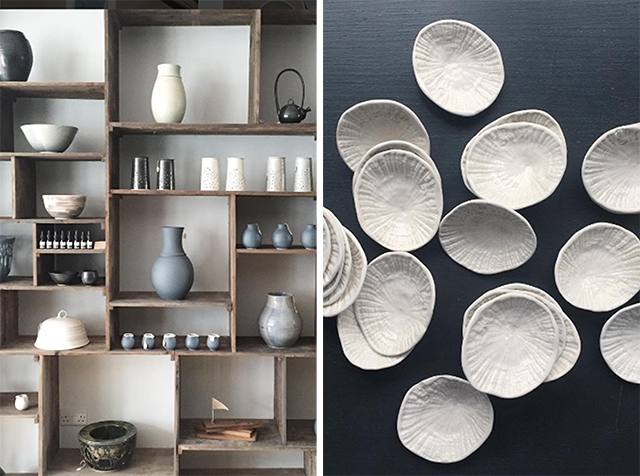 Expect a beautifully curated neutral colour palette interspersed with leafy greens, and plenty of beautiful pottery. EMMA BUCKLEY is a recent graduate of Bath School of Design, and has somewhat of a bare portfolio and a fledgling Instagram account at the moment - but given the quality of her Dye Lines project, I'm really excited to see what she's going to come up with next. The pieces are glazed and fired, then dyed using fabric dyes through a tiny gap in the glaze, which allows the dye to seep through the clay. 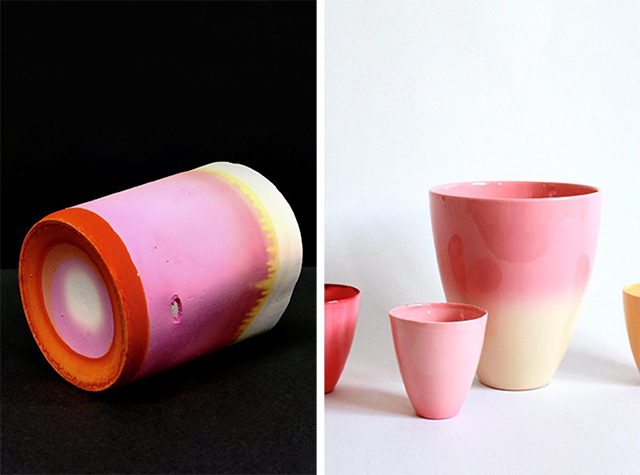 Her simple forms let the soft gradients of orange, pink and blue do the talking. 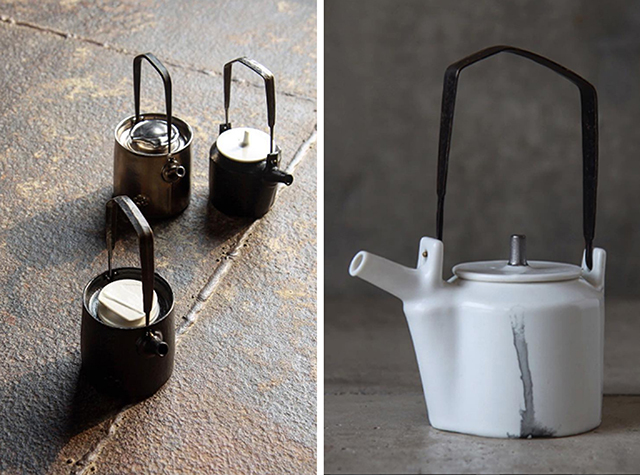 WU WEI CHENG's ceramics are a little different from the others on my list - they're distinctly modern, simultaneously industrial and hand made looking. The attention to detail in combining minimalist, structured forms with often textured, slightly unusual surfaces is great, and makes for unusual but very appealing tableware. His Instagram is a lovely exploration of materials, from his work to the environments he photographs it in. Painter-potter HEATHER BRAUN-DAHL shares beautiful shots of her life in Vancouver (think flowers, Willow the cat, front porches and wild Canadian landscapes), progress shots from the co-op studio she works out of and well styled photographs of her products. 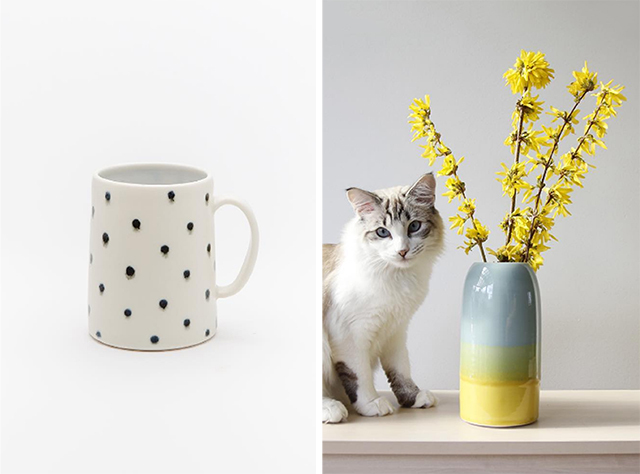 Braun-Dahl has worked with the likes of Anthropologie and West Elm, and sells her lovely painterly, speckled ceramics in a range of colours in here online shop.